This fact sheet provides an introduction to electronic health records and your health information privacy rights. To learn more, refer to the companion resource, Health Records Privacy in California: Answers to Frequently Asked Questions, which provides additional information in a Q&A format. This publication is part of the Health Records Privacy training module. 受HIPAA法令涵蓋的實體單位。 那些HIPAA法令涵蓋的實體單位或其營業附屬部門有侵犯法令規定時，可以向美國衛生公共事業部的公民權益辦公室（OCR)提出申訴：www.hhs.gov/ocr/privacy/hipaa/complaints. 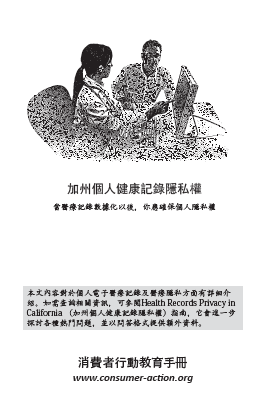 請使用OCR所提供的投訴表（www.hhs.gov/ocr/privacy/hipaa/complaints/hipcomplaintform.pdf), 這個網站提供投訴表格的郵寄地址資訊。查詢詳情，可致電：1-888-368-1019（TDD: 1-800-537-7697）或電郵 [email protected]. © 2013 –2019 Consumer Action. Rights Reserved.